Suzzallo Library, the main undergraduate library on the UW campus, was opened in 1926. 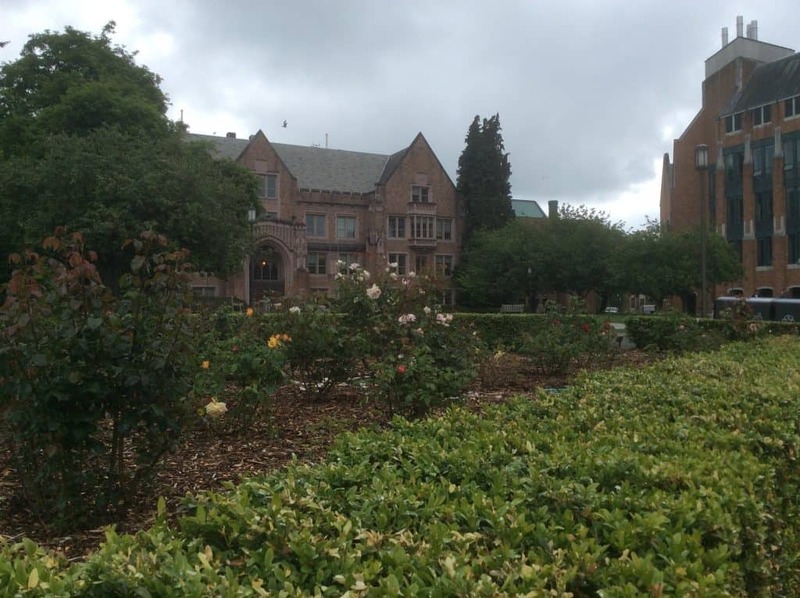 The University of Washington is one of the oldest public universities on the West Coast, chartered in 1861. I spent an entire day on campus during my four-day trip to Seattle in spring, 2015, visiting with professors and students in a variety of different settings around campus. Part of the appeal – much of the appeal – of UW is its location. While it’s not in the heart of downtown Seattle, the main campus is in the “University District,” which is a short bus ride from downtown. Students are encouraged to explore the cultural offerings in Seattle, as well as the very active business community through internship opportunities (Microsoft and Amazon are based in Seattle and hire a large number of UW interns and graduates, especially those who are Computer Science majors). Seattle is a bit like San Francisco – it’s laid-back, creative, transit-friendly, rainy and has some very strong connections with the Pacific Rim/Asia. Students at UW talk about a culture of creativity and innovation here. But classes are large – they almost have to be at a school with 31,000 undergraduates. The University’s focus as a top 10 recipient of federal funding is research, so professor contact for introductory courses is going to be very limited. One professor told my counselor group that there were over a thousand students between two introductory sections of one course. TAs are undergraduates who have taken the course and are paid for assisting professors. The office of First Year Programs runs orientation and other similar programs that help students acclimate to their new home at UW, including Advising and orientation (for students AND parents! ), Freshman Interest Groups and fostering small discussion communities that are similar to a liberal arts experience. Advisers are professionals, not faculty. Guggenheim Hall is home to the aerospace engineering department. UW has over 165 majors and some programs are direct-entry (business, chemistry, computer science, music, engineering). Different majors within the different academic colleges have different core requirements. UW definitely has the big school spirit that many seek in their college experience. A little over 10% of students are involved in Greek life, and those who do join generally live in their fraternity/sorority houses. Housing is NOT guaranteed at UW and dorms are new and beautiful! Sign up early – by May 15th – to have dorm options. There are also many apartments in the University District for students. Who will thrive at UW? Students say go-getters do well here, because what is available is not going to come to your doorstep. Adventurous students who will take advantage of the resources in Seattle will enjoy their time here. 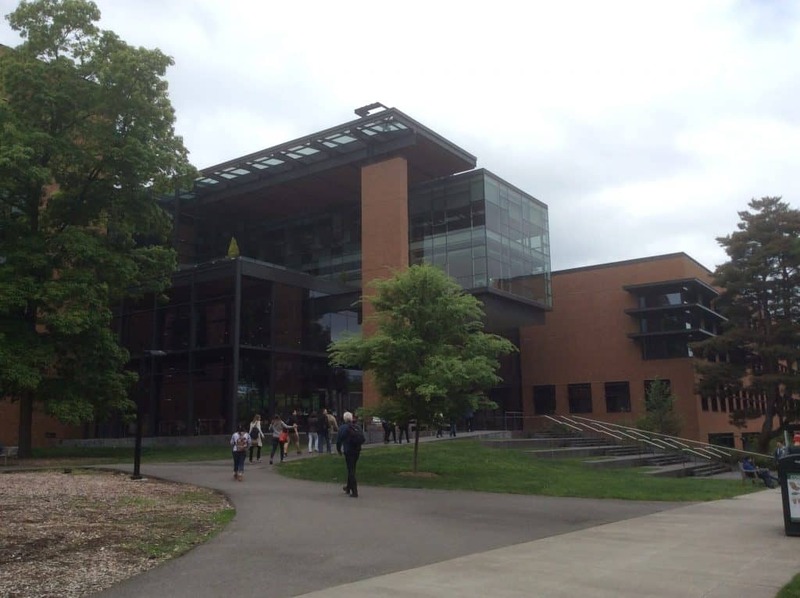 The Foster School of Business is in Paccar Hall. UW has become more competitive over the past few years. The middle 50% SAT scores are CR 520-650; M 580-710; Wr 530-640. However, the admissions process is truly holistic; I met with a woman who has been reviewing files for UW for 20 years! UW does not expect students to have had straight As throughout high school, but they are looking for the academics to be progressively harder as well as extra-curricular leadership in which the student has taken on more and more responsibility. Files are measured with scores for academics as well as personal qualities and achievements, and the office pays special attention to those who have overcome a hardship or who bring something to campus that is underrepresented. 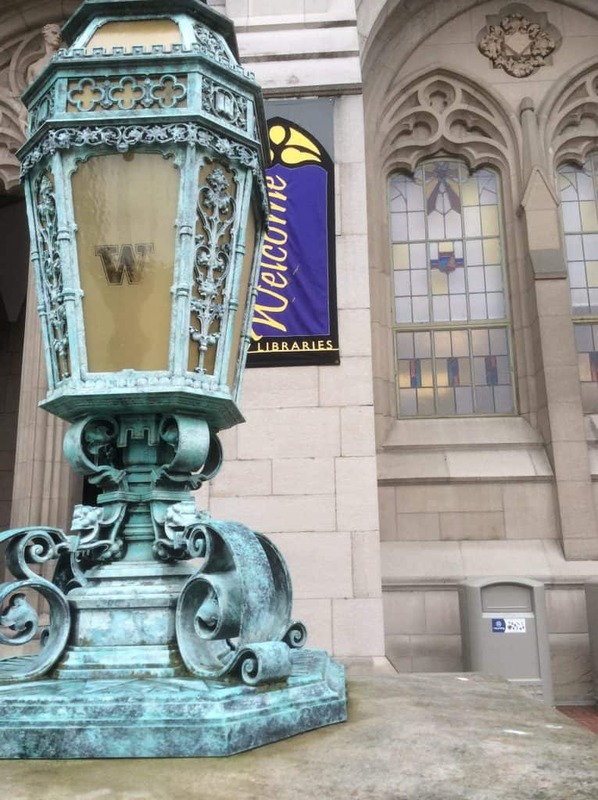 UW allows students to submit one main essay, as well as a list of extra-curricular achievements, and students should take that opportunity to tell their story as well as they can! You can see all of my photos from my visit to UW here.